DUMBARTON staged a second half comeback, but it was not enough to prevent hosts Queen of the South taking three points. 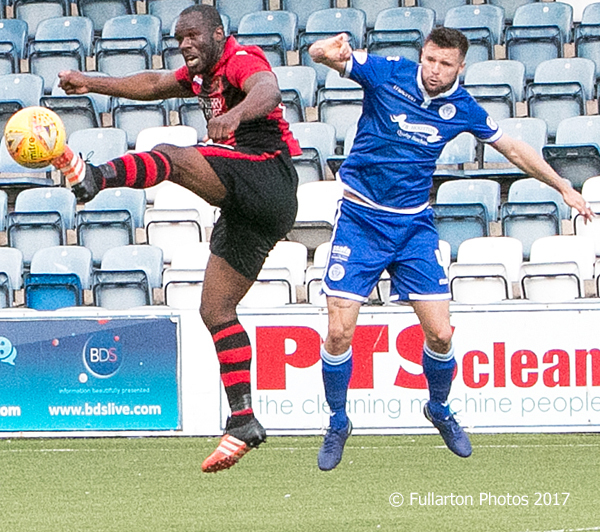 DUMBARTON staged a second half comeback, but it was not enough to prevent hosts Queen of the South taking three points at Palmerston Park. A 1,348 crowd saw the Doonhamers dominate the first half, but they had to hang on in the closing minutes of the match as Sons fought back. Queens dominated the opening exchanges, with ex-Son Stephen Dobbie at the heart of most of their forward manoeuvres and another ex-Son, Chris Kane, always looking dangerous. Sons held out until a few minutes before half time, when defender Callum Fordyce rose above a static Sons defence to head in a softly conceded corner to make it 1-0. After the break Dumbarton began to apply significantly more pressure on their hosts. On 53 minutes Tom Walsh fired over after a header from Andy Dowie was cleared off the line. But despite largely confining their opponents to counter-attacks in the second half, Sons could not find a decisive touch up front to secure an equaliser. The last few minutes were frantic, as Dumbarton threw everything into one last assault, but to no avail. The picture shows Christian Nade sending over a cross.